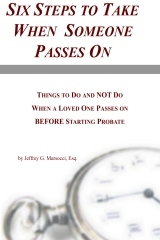 In addition to being an estate planning attorney in the Raleigh and Asheville areas, Mr. Marsocci is also an author of life and estate planning books available for sale on Amazon.com and through it’s subsidiary CreateSpace. In addition, there are some free items for download. Please note that these books and websites are for informational purposes only, and simply purchasing or downloading the materials below does not mean you have engaged Mr. Marsocci or his firm for legal services. * How tax-deferred accounts can impact, positively and negatively, on an overall financial plan…and much, much more explained in Plain English. 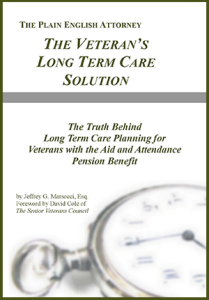 The prevalent “toolbox” Veteran’s Long Term Care solution used today. …and much, much more explained in Plain English. To order, click here. ENOUGH IS ENOUGH. With probate attorneys siphoning estates for an estimated $25 BILLION annually, it is time for the public to FIGHT BACK. Having the RIGHT PLAN in place can help your family AVOID COURT, keep your assets from being depleted by COMPLEX REGULATIONS, and maintain FINANCIAL STABILITY during a crisis. It is time to proclaim that your loved ones will be EMPOWERED and PROTECTED, and they will not be taken advantage of by the court system and probate attorneys any more. You will learn the common pitfalls, misconceptions and “folk remedies” pushed by greedy or unknowing attorneys that can put your plans in jeopardy and cost you and your loved thousands of dollars in unnecessary expenses and taxes. You will learn the single best planning solution for avoiding probate court. And you will learn how to work with true professionals who have your interests at heart to provide you with privacy, security, and peace of mind… and much, much more. $6.99 plus shipping. To order, click here. TAXES ARE OUT OF CONTROL. But the tax code provides tremendous LOOPHOLES you can use to grow your assets into a FAMILY A FORTUNE. Proper trust planning around retirement accounts can provide your loved ones with MULTI-GENERATIONAL WEALTH… but only if you plan ahead, use the RIGHT DOCUMENTS and work with the RIGHT PROFESSIONALS. How tax loopholes around inherited retirement accounts can avoid unnecessary taxes. How proven financial techniques can grow inherited assets exponentially. How the right kind of trust can protect this inheritance from creditors, divorce, and bad spending habits… and much, much more. To Order Click Here. One of the most confusing, agonizing and expensive times we can go through is when we or a loved need long term care. It can be an extremely frustrating time just trying to gather information. What kind of care is best? How expensive is it going to be? Why doesn’t Medicare pay for this? Do we really have to go broke just to get Medicaid to help to pay for this? Where can I get help? Knowing this information can help you ask smarter questions and help you find the right professional to work with. Care Assistance Planning in North Carolina can be filled with misconceptions, pitfalls, and traps, but there is hope and there is help. This book can help you recognize the biggest myths around Care Assistance Planning, review care options, understand the different ways to pay for long term care, and discern fact from fiction when it comes to Medicaid rules in particular. But one thing is certain… you don’t have to go broke and bankrupt your family in North Carolina to get the long term care help you need. Specific steps to take to help get organized. Avoid taking actions out of order that can only frustrate you and family members. Some simple security tasks that can greatly enhance protection for estate assets, from theft outside the family and from within. Meeting guidelines for hiring an Estate Administration Attorney. 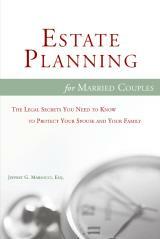 Estate Planning for Married Couples. Protect Yourself and Your Spouse from Making HUGE MISTAKES and Avoid Common Planning Pitfalls and Traps by Taking PROVEN Steps to Secure Your Lives and Your Future. What You’ll Learn: How spouses can maximize their planning goals; The common pitfalls, misconceptions, and ‘folk remedies’ that can put your plans in jeopardy and cost you and your family thousands of dollars in unnecessary expenses and taxes; The single best overall planning solution for married couples to give their plans life; How to work with an attorney to provide your family with the most privacy, security, and peace of mind possible. Price $19.97. Estate Planning for Domestic Partners. Don’t Fall Victim to Discriminatory Laws! Not when you and your partner can do something about it. You and your partner can empower yourselves though the proven legal techniques described in the book Estate Planning for Domestic Partners: The Legal Secrets You Need to Know to Protect Your Partner and Your Future. Written by a prominent partner protection planning attorney, this valuable information can help you navigate around the restrictive laws that prevent you and your partner from gaining full marriage and tax rights by using other legal principles such as contracts, trusts, and powers of attorney. $19.97 plus shipping. The Joint Property Tax Trap. JOINT PROPERTY CAN DESTROY YOUR ESTATE. While it seems easy to retitle accounts as joint with a right of survivorship, it can come with DEVASTATING TAXES and LAWSUIT LIABILITY. But there are legal and effective planning solutions to help your family AVOID PROBATE and UNNECESSARY TAXES. Trust planning can provide PEACE OF MIND… but only if you plan ahead, use the RIGHT DOCUMENTS and work with the RIGHT PROFESSIONALS. You’ll learn how folk remedies like joint property can produce a tax and legal nightmare; how proven planning techniques can avoid the probate process while avoiding unnecessary taxes; and how a trust can protect your assets from your children’s divorcing spouses and bad spending habits. $6.99 plus shipping. To order, click here. JOINT PROPERTY CAN DESTROY YOUR ESTATE. While it seems easy to retitle accounts as joint with a right of survivorship, it can come with DEVASTATING TAXES and LAWSUIT LIABILITY. But there are legal and effective planning solutions to help your family AVOID PROBATE and UNNECESSARY TAXES. Trust planning can provide PEACE OF MIND… but only if you plan ahead, use the RIGHT DOCUMENTS and work with the RIGHT PROFESSIONALS. You will learn how folk remedies like joint property can produce a tax and legal nightmare, how proven planning techniques can avoid the probate process while avoiding unnecessary taxes and lawsuit liability, and how a trust can protect your assets from your children’s divorcing spouses and bad spending habits… and much, much more. Price $11.95. To order, click here. 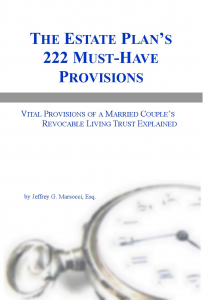 The Estate Plan’s 222 Must-Have Provisions. PROTECT your spouse and family from INFERIOR TRUST DOCUMENTS and avoid common ATTORNEY DRAFTING MISTAKES by using The Estate Plan’s nationally-praised Revocable Living Trust. 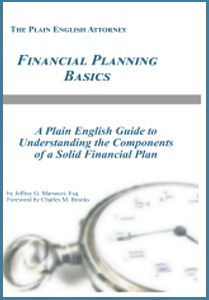 * The essential provisions to maximize estate tax savings. * Critical elements necessary to protect an inheritance for young beneficiaries from irresponsible spending. * The powers necessary for Trustees to carry out your wishes and protect the assets you spent a lifetime building. * Vital restrictions to prevent outsiders from successfully challenging your plans… and much, much more. Price $5.49. To order, click here.